The Old Overholt and Other StoriesMichaela Casey, a Dorchester native who now lives in Maine, has published a book full of short stories inspired by the life and times of her larger-than-life father, Thomas Casey, a longtime, well-known civic and parish leader in Dorchester who died eight years ago at age 95. Both compassion and heartbreak have made it into “The Old Overholt,” which offers Tim Cadigan, among other exploits, serving as a paratrooper in England and flagging down Pope John Paul II with a sign promising free sandwiches and beer. Many of the stories are told through the lens of a friend or family member. Mitch Goldberg, the fictional narrator of the collection, acts as the chronicler who knits the stories together. Instead of crafting a memoir about her father’s life, Michaela turned to fiction, which she has enjoyed both reading and writing throughout her life. “Writing my father in fiction gave me the freedom to invent little details, and to think about what my father would have done in situations he didn’t live through, and the ones that he did,” she said. The real-life Thomas Casey was deeply involved in neighborhood life in Dorchester. He was a founding member of the Columbia-Savin Hill Civic Association, Bay Cove Human Services, and the Federated Dorchester Neighborhood Houses (now known as College Bound Dorchester.) Although Michaela began writing soon after her father’s death, her teaching position at Buckingham Browne & Nichols School kept her from focusing her full energies on publishing her work. During the difficult stretches of the crafting process, she sometimes called out to her father a simple, needful plea. As she wrote, Michaela continued to live in her family’s three-decker house on Columbia Road. It was in this house that she absorbed the stories that are the touchstone of her collection. 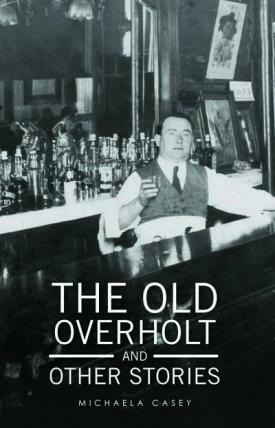 The cover of “The Old Overholt”– a grainy, sepia-toned photo of a bartender looking to the right of the camera—is one of those stories. Michaela and her husband, Bob O’Brian, retired from their teaching jobs last June, moved out of the old house and neighborhood, and have settled in Newry, Maine, where the deep woods life is been a refreshing change of pace. She plans to continue writing. The book, which was launched on Jan. 4, is available for purchase and download at Amazon.com and other online booksellers.